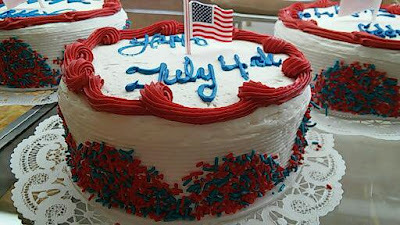 Our Nation will be celebrating it's "birthday" on Monday July 4th. Out comes the red, white, and blue in honor of the day. Hot Dogs, Apple Pie, Lemonade and Fireworks fill the weekend agenda across all states. Whether you're heading to the shore, a neighborhood parade, or a picnic... Haegele's wishes you a safe and happy Independence Day celebration. With our flags proudly hung, the bakery will be open with regular hours thru Saturday 7/2. Our Thanks and gratitude to our U.S. Military is also raised along with our flags. Our freedoms of "Life, Liberty, and the Pursuit of Happiness" are protected through their service. Haegele's will be open next week as well, with regular business hours. Thursday 7/7 brings another "birthday" celebration. With a little less notoriety and a few less candles, Haegele's will celebrate 86 years in Business. July 7th, 1930 we opened our front door for the first time and 86 years later our customers are still opening that very same door. Some modern siding and an updated sign or two later, and Haegele's still looks pretty much the same! We taste the same too, as we continue to be committed to quality and our tried and true recipes of yesteryear. Come celebrate on Thursday with us and have a piece of birthday cake too. With Big Band music on the radio, a 25 cent special, and a glance at our store, you'll be taking a step back in time. Bring your memories as we blow out the candles and cut the cake!